“You came this far south for up-north weather,” he joked as he wiped grease from his hands and stood up from the ditch he was cleaning of Autumn’s leafy debris. A maintenance guy at Unicoi State Park in Georgia’s slice of the Appalachian Mountains, we’d been chit-chatting about the things people tend to small talk over. “Where are you folks from?” the types of questions he was asking, “Do you just love working at a place like this?” my return inquiries. Neither of us had much in the way of heartfelt answers. We were just two individuals sharing a corner of the earth. This particular corner being covered in every available hue of Fall foliage. Golden greenish oak leaves the size of a basketball player’s hand. Red and yellow maples swimming in the wind. Dull tans, black-spotted crumpled dark browns, and oranges all in between. I believe I was staring at the stark contrast of a hickory tree’s large yellow leaves against it’s nearly black bark when I noticed he was finished, nodded, and made his way to the next worksite. There’s something about the blue of a clear sky on a particularly cold day. You can feel that color, that frigid bite to everything, even when looking at it all through windows and tucked into a warm building. So it has been a chilly November, unseasonably so say the locals, but even now as the nation finds ourselves but a week away from Thanksgiving, Georgia’s forests have not relented. They are a secret, not to Georgians, but to the rest of the nation. No one thinks, “Autumn, let’s drive to Georgia and check out the leaves!” I’m not sure anyone even thinks, “Camping? Let’s go to Georgia!” But it has proven every bit as bold as New England and Western North Carolina, just longer lived. In the mountains of Northern Georgia, where the Appalachian Trail begins, live a handful of state parks that provide a perfect canvas for foggy mornings cut with good coffee, day hikes basking in the sun draping through the holes in the forest canopy, and evenings best spent close to a campfire. 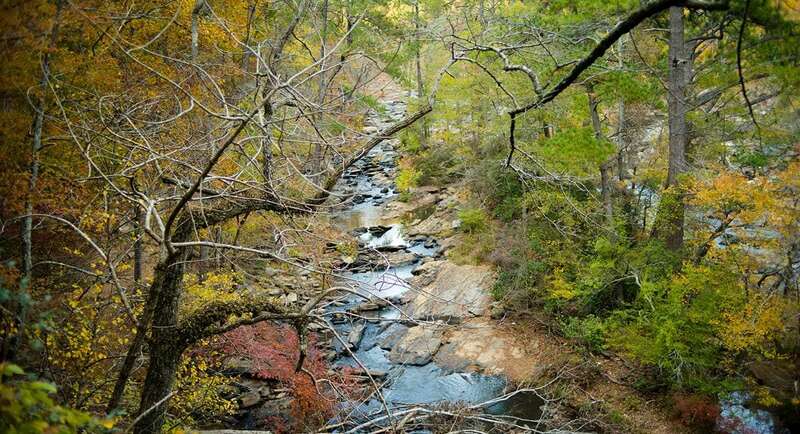 It’s the Chattahoochee National Forest which binds them all together, fills the spaces in between, and offers a national stage for one of the nation’s greatest state park systems. Given the irony of the lyrics this time of year, my mind won’t stop playing the opening two lines to the Allen Jackson song over and over again in my head. And so that tune hums itself all through my head as my boots pick up traction in hiking trails endless, as the color of the forest reflects pristine off of calm lakes numerous, and as another day in the life of Northern Georgia passes by. The nights are dark. Intense pinholes pierced in the black dome above let starlight twinkle through. Quiet is a relative term, but it is more quiet now, just before dawn, then any other time. The raccoons have gone to sleep, and the songbirds have yet to stir. And then, on queue and in full regalia, that fat old sun delivers. The black of the night sky goes purple, fading into pink, then a soft blue. The world begins to stir, and another day of Autumn in Georgia is upon us. 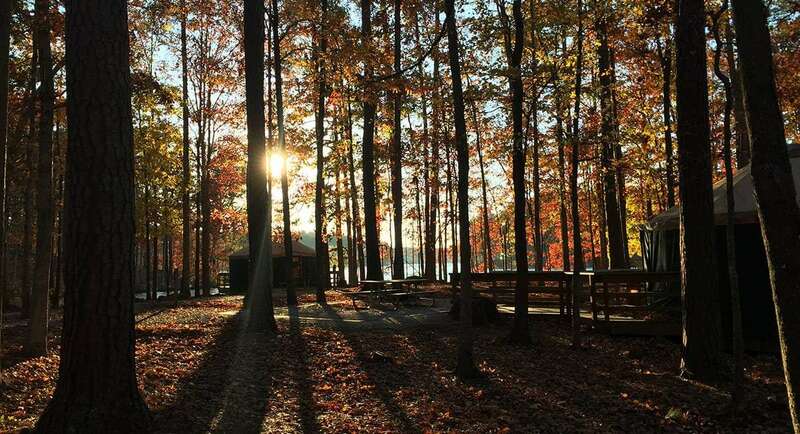 A relaxing camper’s weekend, cool climes and plenty of trout to be caught in Moccasin Creek State Park. RVers at Moccasin Creek State Park are sitting around their dinette, the smell of Folgers accompanies the bubbling sound of their coffee maker. The Falcons beat the Buccaneers, the highlight of the day’s newspaper for this retired couple on their way to Florida for the winter. 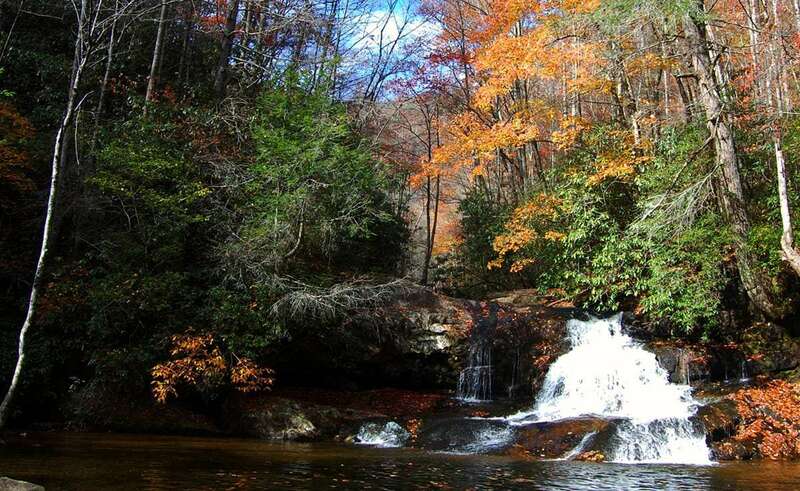 Moccasin Creek itself is flowing steadily, and after coffee they’ll make the one mile trek up to Hemlock Falls. The spray of the falling water will dot surrounding rocks, wet the fallen leaves, and the RVers will spend the evening recounting the natural beauty of gravity’s effect on liquid. More info, booking details and photos of Unicoi State Park at Explore Georgia. Countless creeks like this will splash through the forest and find their way into lakes, mostly manmade, which serve as the center pieces of many of the state parks. With the colder temperatures, fewer fisherman and kayakers are out on the water. 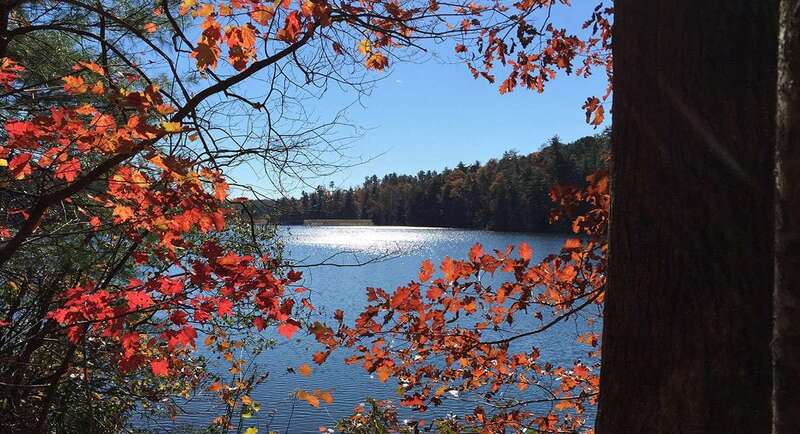 The surface of Unicoi Lake will reflect perfectly the surrounding mountains, as will that of Fort Yargo and Fort Mountain Lakes. Pristine will be at best adequate, more likely an understatement. A couple finishing their own morning coffee at Fort Yargo will emerge from their yurt just in time to see a great blue heron take flight, his legs leaving a driftwood fallen log as his wide wings just miss the surface of the lake he’s patrolling for a breakfast of his own. 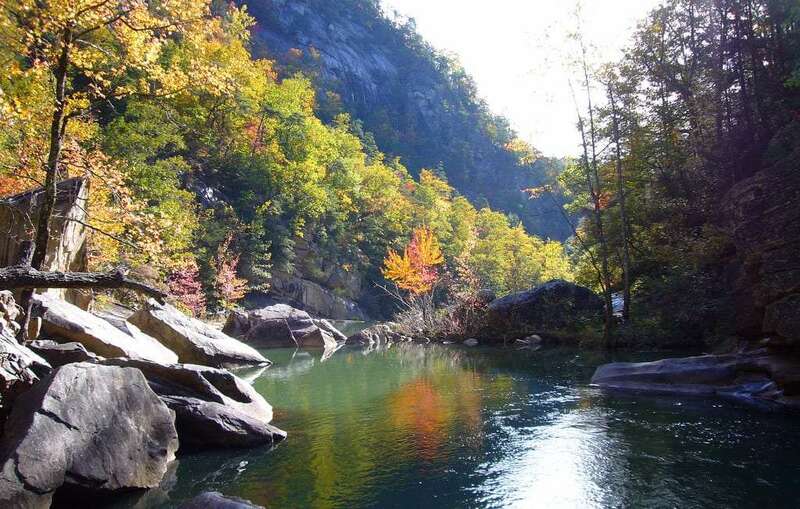 Waterfalls crash into pristine pools reflecting a renewed Chattahoochee National Forest. Near the northeastern edge of the state, the Tallulah River is doing it’s “just another day in the neighborhood.” Minuscule amounts of the walls and floor around it are eroded every day, and over time it’s created the surrounding gorge of the same name. Brook and rainbow trout swim in the thicker pools gathering here and there. Leaves play parachute from the top of it all, only to land and kayak themselves down the remaining stretch of river. Thousand foot walls rise up. A series of waterfalls with majestic names like Oceana and Tempesta drop as the river winds downhill. Tourists tower above it all, the sun now high in the afternoon sky. Vultures and hawks circle above them, and that fat old son continues its procession across the wide blue yonder over Georgia. Tallulah Gorge State Park. Photo by Gina. 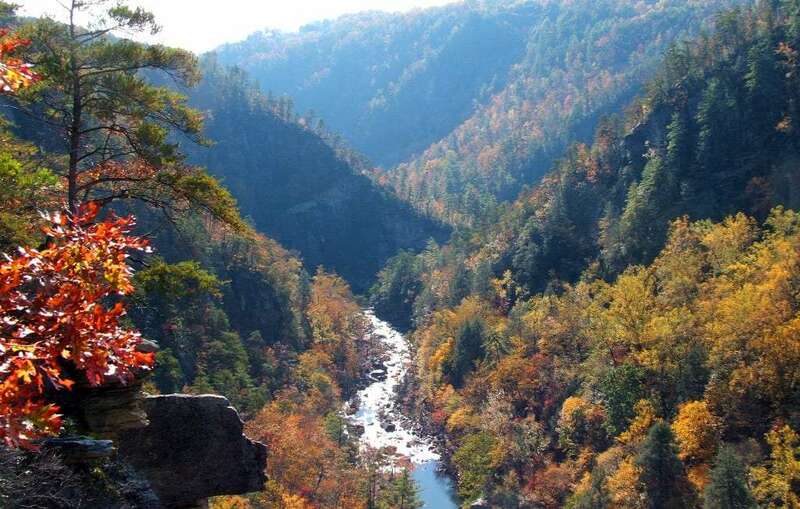 Tallulah Gorge. Photo by Martin Bravenboer. 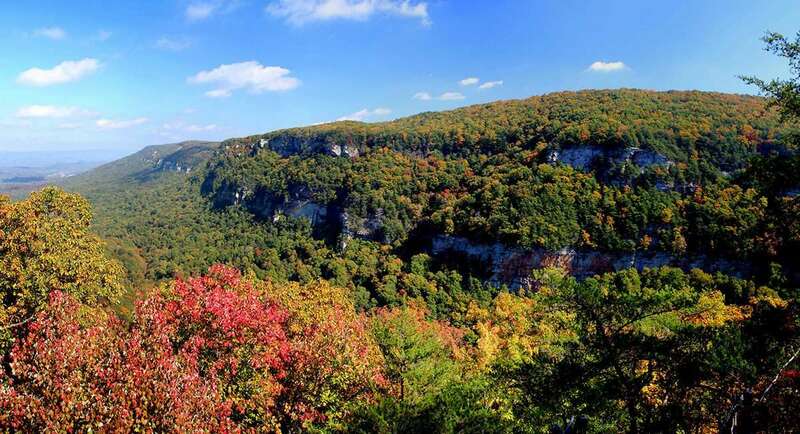 Rugged mountain slopes make for stunning gorges and spectacular vistas high in Cloudland State Park. Across the state to the west, afternoon is not participating in quite the same way as the rest of the state. 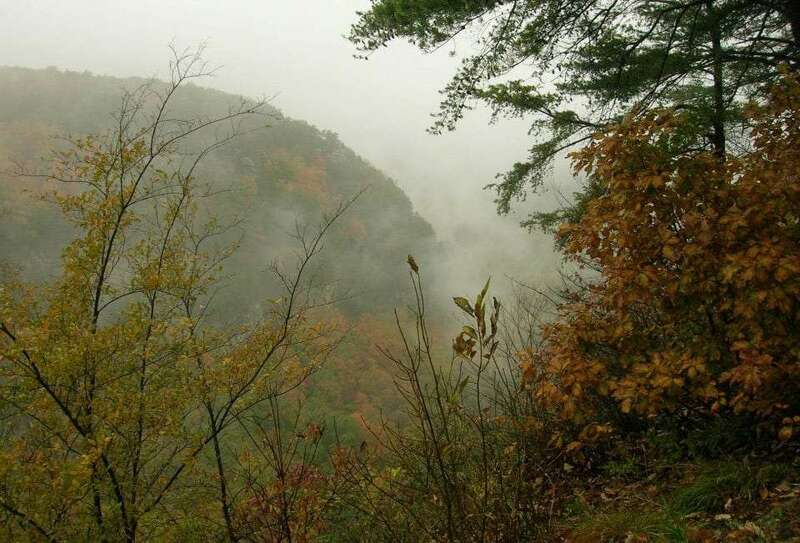 A thick fog still rests even high in the mountains near Cloudland State Park. Perhaps if the mountains were a few thousand feet higher, the incentive to hike up and out of the mist might taunt some tenters to blow off the next day’s work and stay one more night. For local wildlife, it means an empty forest, a playground, an easy day of finding food without the perceived threat of humanity encroaching. Whitetail does are already pregnant and readying themselves for the winter months. Black bears are contemplating their version of hibernation, more of a deep sleep, as warmth and food can remain available year round in some parts of the state. 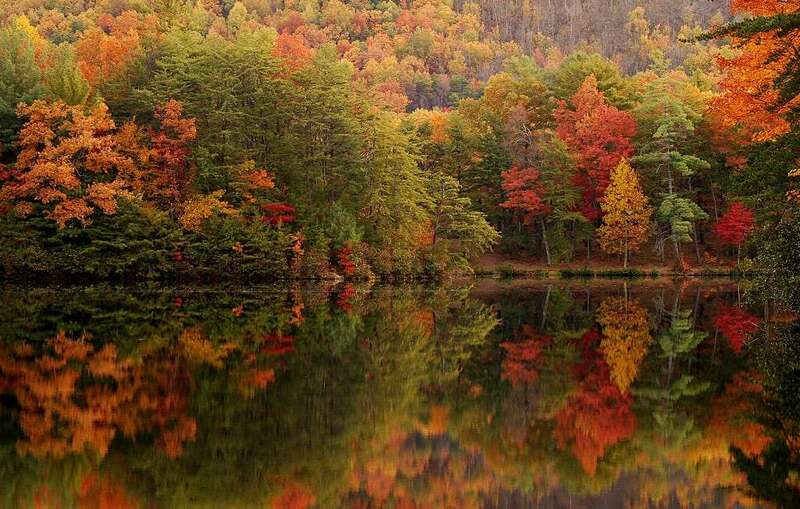 There is something so brilliant about the simplicity of what fall is, and yet the complexity of it at the same time. 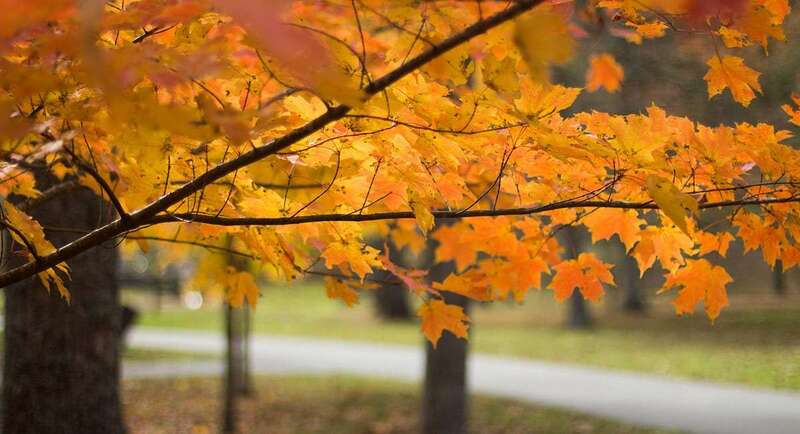 At the most basic level, the foliage of much of the nation simply dies, shed so that the trees will need to work less during the colder winter months. The process behind that all is of course nearly impossibly difficult to explain, and all of the simultaneous happenings that occur–from hunters claiming game that will keep them in lean jerky all winter long to squirrels building nests high in longleaf pines–make an afternoon spent in the forest better than any night of television ever produced. Just sitting still, on a log, on a stone, looking over a secluded waterfall or a corner of a lake where no one else roams, a spectacle unfolds. Even if it is as simple as a brilliant yellow leaf released from a high up branch and floating back and forth to the ground below. Time gets the better of you, and just as the season is now fleeting, and there’s nowhere south left to run before you hit the tropical clime of Florida, so does night fall over it all. 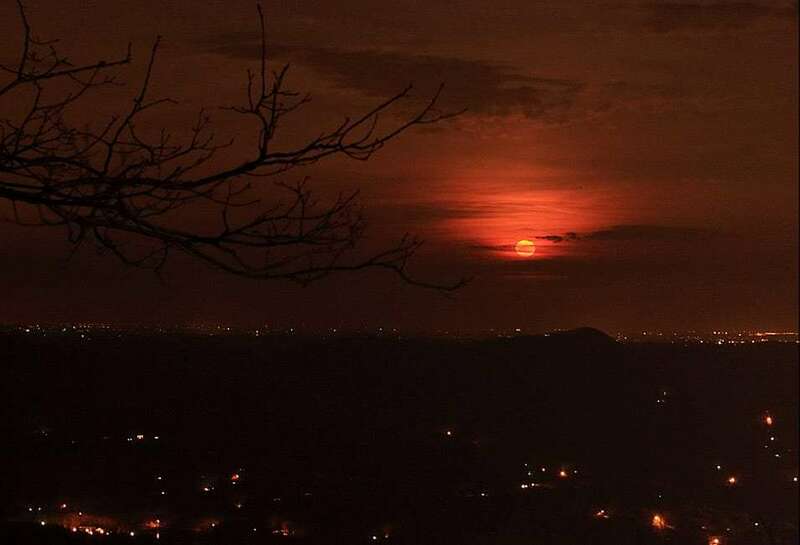 The moon rises over Georgia, and the cycle begins again, only one day closer to winter. Vogel State Park. Photo by John Tuttle. Sweetwater State Park. Photo by Oscar Shen. Fort Mountain State Park. Photo by J. Andrew Flenniken. A run through of the major ways most full-timers get around, from backpacking hostelers to rock stars in RVs to renting houses for a few months at a clip.